Let’s get cracking, because I’m a busy man with deadlines to meet and interviews to do. Indeed, that’s often the way I feel it has to be, trying to get ahead in the city. So why should I be taking it slow? First, let’s underscore what the whole Slow culture quake is about. It’s not anti-speed. It’s not about doing everything in slow motion. It’s about doing things at the right speed – what musicians call the tempo giusto. 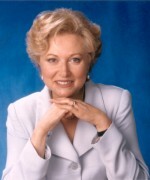 Every act has the right rhythm for it, and if you find that rhythm you’re going to do it better and enjoy it more. Particularly in cities, we get infected by this virus of hurry, where our default mode is to do everything as fast as possible. We fall into the trap of trying to do more and more things in less and less time, putting quantity before quality in everything we do. 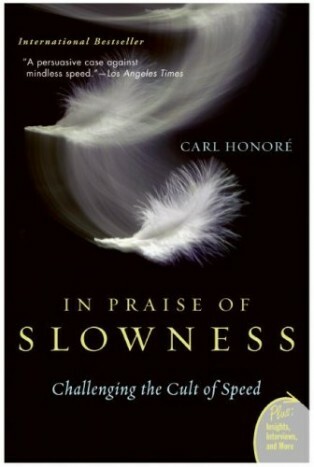 The “cult of speed”, as you put it in your book In Praise of Slowness. The cult of speed is the dictum that faster is always better. We used to dial, now we speed dial. We used to walk, now we speed walk. We used to date, now we speed date. We think that to make anything better, you speed it up. That is true even in activities and pursuits that are by their very nature designed to slow us down. There’s a gym not far from my office that offers a course in speed yoga, for professionals who want to bend their body into the lotus position in 20 minutes instead of an hour. Even our most sacred rituals are being accelerated. The US has churches that are playing around with drive-through funerals. This goes right back to the origins of how people measure time. From when people first used sundials to parse up time, they began to get worried about whether they were using it wisely. In medieval times, the arrival of clocks in town squares changed things again. That was ramped up by the industrial revolution, where suddenly we had machines to make everything go faster. We’ve been on an upward curve of acceleration for at least 150 years since then. For most of that time, I would argue that acceleration was doing more good than bad. But it seems to me that in the last 10 or 15 years, the pendulum has swung in the other direction. Our addiction to speed is backfiring on us. And now it has reached its apex in the age of information? It has reached its apotheosis, and it’s now hard to argue that speeding up is a good thing. Even in the financial markets, look what happened with the meltdown in 2008. Money got too fast. The basic problem was that nobody had the time or the incentive to lift up the bonnet and see if the engine was overheating, or work out whether these credit default swaps were worth the paper they were written on. It was all about fast growth, fast profits, fast debt, fast turnaround. And it almost drove us over a cliff edge. Tell us more about the slow movement, and how it emerged to counter that culture of acceleration. There has always been a parallel track for contesting the notion that faster is better – a countercurrent for slow. Thoreau going to Walden pond, Nietzsche talking about too much speed, Bertrand Russell, the hippies. Then in the eighties the Slow Food movement came along and took back the word “slow”, which has become a four-letter word in our culture, and said fast food was detrimental. They were focused on food, but since then that slow moniker or tag has become a global shorthand for a better, more balanced way of doing everything. In Praise of Slowness started from a very personal place, when I found myself stuck in roadrunner mode, and speed reading bedtime stories to my son. I toyed with the idea of buying a book of one-minute stories, Snow White boiled down to 60 seconds. My epiphany was that if even a moment like that – which should be sacred and intimate, when a father sits down and reads to his son at the end of the day – can get hijacked by hurry, then we have really lost our bearings. So I have a very clear before and after. I felt like every moment of my day was a race against the clock. I felt hurried all the time, and like I never had the time for anything. Now I almost never feel like that. A lot about it is about changing your attitude. There are also concrete things you can do. I say no to a lot of things now, which is an essential step for everybody because we’re all striving to do way too many things. Rather, you should concentrate on the things that are most meaningful to you. I think we have an unhealthy, neurotic relationship with time. Wasting time is the great sin in the early 21st century. We view the world as a smörgåsbord of experiences and products – things to do and consume – so how could you ever be bored? Don’t sit still, do something! That’s become a kind of tyranny, and drives us into a tunnel of constant busyness, distraction and acceleration, so we end up skimming the surface of our lives rather than living them. Everywhere you hear people saying – as you kicked off this conversation – that there’s no alternative to going fast. And speed is a natural human impulse. We have a fixed period of time here, and there’s a natural tendency to want to do as much as possible in it. We have created a whole edifice to feed that lust, that hunger, that need. We’ve stumbled into a form of capitalism and consumer culture that is doing much more harm than good. When it really gets going, it’s like machine gun fire. 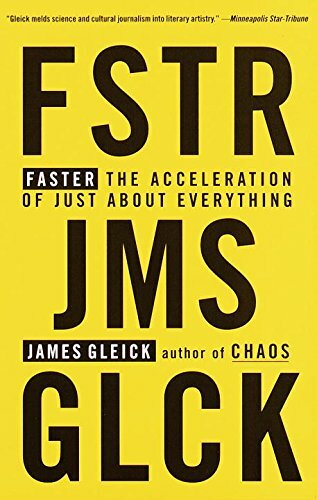 Let’s continue to define the terms of this speedy age with Faster, by James Gleick. 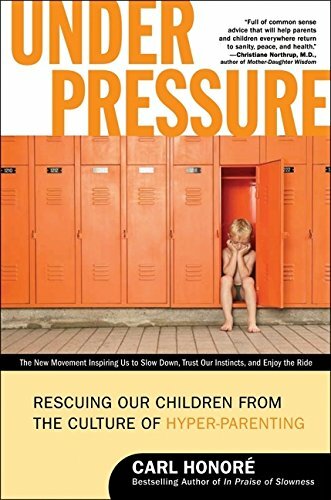 This was one of the first books that I read when I began thinking about these ideas of fast and slow, speed and deceleration. It’s a funny kind of book, descriptive and not prescriptive. There’s an undercurrent of disapproval of this acceleration, but it feels more like a scientific cataloguing of all the manifestations of our fast culture. How long people are prepared to wait on hold on a phone before they hang up, or for the doors to close in elevators – that kind of thing. The book itself is a bit breathless, and it consolidated my feelings that everything was speeding up, with diminishing returns and to the point of absurdity. Is it technology and our gadgets that make modern life so fast paced? It’s a very complex interplay of lots of different things. I certainly don’t blame the technology. Gadgets are neutral – they’re tools, and it’s down to how we use them. Many people think the slow movement is Luddite, but I think it’s about using technology to find the right tempo. I have an iPhone, I have wireless on my laptop, I use Twitter and Facebook – but I use all of that stuff with what I consider to be a slow spirit. I don’t feel like I’m harassed by these gadgets, or a slave to them. Throughout history, when a new technology comes along it takes a while for people to work out the new cultural norms and social mores around it. There was a story in the papers the other week about a café owner in Norfolk who refused to serve customers who came to the counter talking on the phone. There are quiet coaches on British trains. The first thing David Cameron did when he took over government was to ban the use of smartphones in cabinet meetings, so that ministers would shut it all out and focus. Damn, so we can’t read Michael Gove’s tweets in real time. I guess he’ll have to tweet in the loo afterwards. 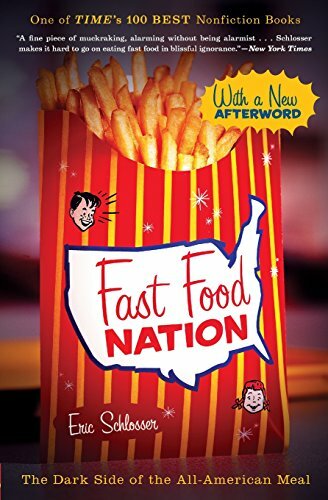 The other “fast” book on your list is Eric Schlosser’s Fast Food Nation. We’ve talked about the Slow Food movement already, which began in 1986 to resist the opening of a McDonald’s near the Spanish Steps in Rome. This book again pulled together a lot of things I was hearing about in a journalistic, methodical, rigorous fashion. I found it a very alarming read, but also a reassuring one. One of the charges leveled at those who sing the praises of slowness is that we can get tarred with the brush of new ageism or airy fairyness. I’m not at all from that school. I’m a journalist and rigorous, and I know that Eric Schlosser is the same. Everything in Fast Food Nation is fact-checked. The first chapter in my own book is about food, because it seems to me the heart of the human experience. We consume it three or four times a day, and it’s very much part of our everyday existence. It’s something we put into our bodies to stoke the engine, but it’s also immensely political. Whenever you pick up a morsel of food on the end of your fork, you’re making a political statement about what kind of world you want to live in. There’s a story behind how that food got to your plate. You’re saying how you believe agriculture should work, how we should interact with the environment, not to mention all of the social and cultural aspects of food. Food is imbued with so much meaning for us, and not just in a Proustian sense, like Nigel Slater’s Toast. So the idea that something so precious and central to our experience has been spoiled by this cult of speed seemed to me a very powerful metaphor, and a useful door into the discussion of why slow is good. It’s commonplace these days to have your lunch “al desco”. And it’s not healthy. The faster you eat, the worse it is for you in so many different ways. You miss out on the sensory pleasure of consuming food, enjoying all of the flavours and textures when you eat something with your full attention, as opposed to wolfing it down while checking your inbox. It’s important to find time to focus on your food, to eat and only be eating. That could be 15 minutes sitting on the park bench, or it could be a siesta and a bottle of wine after lunch. You have to tailor it to your schedule. 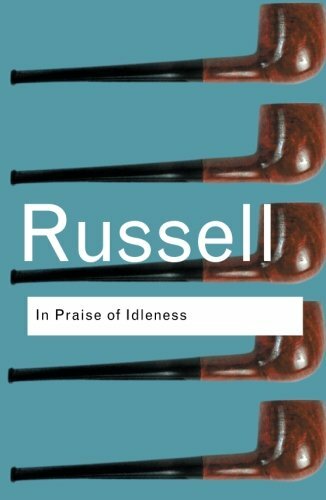 Let’s move on to your slower selections with Bertrand Russell’s essay In Praise of Idleness. This is wonderful, but feels dated to me. It was written in 1932 so it’s from a different era, when there was still the landed gentry. His basic thesis is that one of the ills of the modern world is the lie that has been sold to us that work is a virtuous and ennobling thing. His argument is that that’s a form of social control – keeping people down by keeping them working. There’s also the puritan idea of idle hands being the devil’s workshop. He makes the counter-suggestion that we ought to be working less, and freeing up more hours to pursue leisure. There are different forms of leisure, of course, some of which is passive and probably not worth striving for. Russell’s argument is that if we went to a four-hour day, and rejigged our culture and social institutions accordingly, then mankind – from the top to the bottom of the social scale – would plunge into active, ennobling forms of leisure, and we would all live in a kinder, gentler society. Russell has written about tolerance, free speech, liberty, humanist values. Do you think he feels that slowness engenders all of these other positives? Yes I think that’s his take, and it’s mine as well. Milan Kundera talks about the wisdom of slowness – the notion that if you slow down, you have more time and space to ask the big questions and contemplate deeper ideas. A fast approach tends to be a superficial one, but when you slow down you begin to engage more deeply with whatever it is you’re doing. You’re also forced to confront what’s happening inside you – which is one of the reasons why I think we find it so hard to slow down. Speed becomes a form of denial. It’s a way of running away from those more deeper, tangled problems. Instead of focusing on questions like who am I, and what is my role here, it all becomes a superficial to-do list. The point that Bertrand Russell makes persuasively and eloquently is that there is an intimate link between slowness and living more deeply and fulfillingly. One of his arguments that I think is timeless is that one of the tyrannies of capitalism of any era is production. It denigrates the idea of doing something for its own sake – you’ve got to measure some kind of outcome. You even see that in the way that people parent today. It’s not enough for a child to go to the park and kick a football around – they’ve got to be in a football clinic with a coach. It has to be something you can put on a CV, rather than just doing it for its own sake. In Praise of Idleness is a glorious paean to doing nothing, or doing things because that’s where the spirit takes you, rather than thinking what you are going to get out of it. What is The Discovery of Slowness? This is a great work of historical fiction about the 19th century British Arctic explorer John Franklin, who eventually went missing looking for the Northwest passage. In one sense, it is a classical historical novel which retells the story with verve and vim. 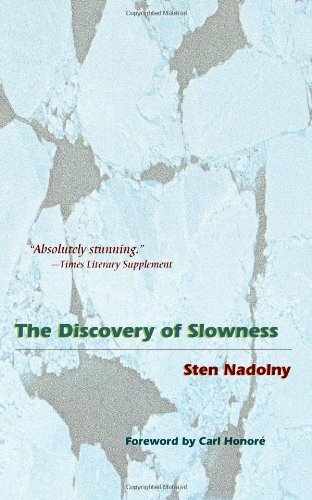 But Sten Nadolny also imbues it with a discussion of slowness. Franklin was by nature slow, and because of that he was out of step with the times and constantly in conflict with other people, right from the playground when he never had a ready comeback when the other kids teased him. He is condemned for being slow, but later in life his slowness came to be seen as a mark of deep thinking, care, wisdom and intelligence. That is woven as a leitmotif throughout the book. Franklin made comments in his diary about the absurd impatience of London, with people charging around and not really being present. And there are some wonderful set pieces, although they were likely invented to soup up the slowness narrative. During the Battle of Trafalgar, for instance, he and his shipmates are tangling with a French ship and a French sniper is picking off the British soldiers one by one, hidden in the rigging above. Franklin takes aim at the sniper, working the angles and the wind while everyone is hurrying him, shouting “shoot!”. But he ignores it, slows right down, and of course kills the sniper. In that time, as today, the word “slow” has connotations of stupidity. “He’s a bit slow,” we say of someone who isn’t the sharpest knife in the kitchen. I want to break that taboo. It’s a word to dismiss and denigrate people. It’s synonymous with lazy, torpid, unmodern, stupid – and that’s not just in English but in other languages as well. But while that taboo has taken hold, and strengthened through the 20th century, there has always been a countercurrent of people saying there is a lot to be gained from slowing down. Charles Darwin described himself as a slow thinker. Einstein famously sat in his office in Yale gazing into the middle distance for hours on end, before emerging with game changing mathematical formulae. Certainly in the intellectual world and the arts, people have always understood the power of looking slowly at the big picture. Finally, tell me about Milan Kundera’s 1995 novel Slowness. This is more an impressionistic, stream-of-consciousness book. His writing is very mellifluous. I remember devouring it in a single sitting – it’s only 132 pages long – and I like the way Kundera tackles big ideas through very readable fiction. Slowness explores the romantic collisions and entanglements of several characters who seem at first unconnected. Some are in the modern world, others are in the 18th century, but weirdly they come together and interact at the end of the novel. The book is also a meditation on speed, technology and slowness, and how these shape our experience of the world, other people and ourselves. 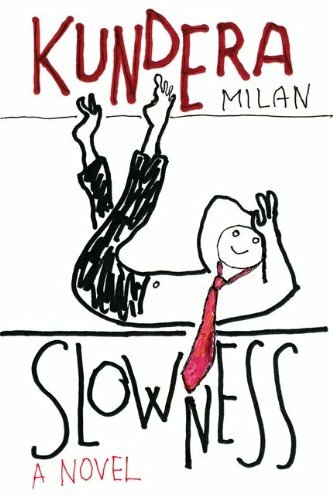 Kundera suggests that slowness opens the way to wisdom, memory, sensuality and humanity. A slower world, he seems to be saying, would be a better place. For anyone wanting to delve into the metaphysical underpinnings of the slow revolution, this is the perfect primer. Will you leave us with some practical, everyday measures of how to live slowly? The first thing that everybody should do is simply do less. We are chronically trying to do too many things. If you write down everything you are trying to do in an average week, put them in order of importance, I think you would be surprised at how easy it is to start dropping things off from the bottom. Even now people are still watching four hours of TV a day, then turning to each other on the sofa and saying it’s terrible how I have no time. And a lot of us could spend less time wilfing around on the Internet, using it in a more focused way. It’s also very important to switch off – to have moments every day when you turn off. Our gadgets have become weapons of mass distraction – we’re never in one moment, because it’s so easy to be in two or three moments at once. Even if your phone isn’t ringing, you might be thinking: Why hasn’t it rung? Or was that a vibration I felt? I think it’s essential, like David Cameron in the cabinet meetings, to say there are times to be switched on, and times just to be two people sitting across a table, as we are, listening and talking to one another. Finally, it helps to incorporate some kind of a slowing ritual into your day. That is going to be different for every person. It might be reading poetry, it might be gardening, or knitting, or crafts or painting. Anything which acts as a brake and shifts you out of that mentality of speed. For me it’s cooking, and yoga. It’s also important to remember that while being slow is about reconnecting with your inner tortoise, we all have an inner hare too. Slow is about relearning the lost art of shifting gears. There are times to be fast. Speed is wonderful, thrilling, liberating, fun, and it can be immensely productive. I’m not anti speed. I love speed. I live in London, I play ice hockey, I work in media. I think speed is magnificent and I wouldn’t want to live without it. But you’ve got to have a range of speeds. Like any piece of music, you can’t have just one tempo. I guess what it boils down to is that slow is ultimately a state of mind. You can be slow anywhere – in the centre of London or in a cottage in the Scottish Highlands. It’s about how you approach and use time. Do you arrive at each moment thinking: How am I going to get this done as fast as possible? Or how can I get this done as well as possible? Once you’ve changed that inner chip, you can start living a slow life.